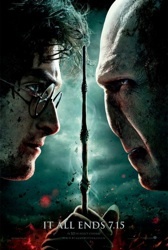 Patrick and Doug F Harry Potter and the Deathly Hallows Part II and reach their own epic conclusions. I really enjoyed listening to this. I really loved the books and I do have some quibbles with the movies, but like you said, I can always read the books again if that's what I'm after. The epilogue isn't my favorite thing, but I have to disagree a little. I didn't feel it was showing that Harry and Ginny were still together, but that Harry had a family. To me, that was what Harry always wanted, from the first movie with his awful aunt and uncle and where he saw his parents in the Mirror of Erised (in the book, it was even more obvious--he saw grandparents and other relatives in there as well). It's not like it's unexpected that Harry and Ginny had kids (the epilogue featuring Harry and Ginny dealing with fertility issues? No, thank you), but to me, it was very satisfying that Harry finally had what he always wanted. Very side note (and again, in the books, not the movies), but Harry did name his first son James Sirius and then the second son was Albus Severus. (In the movie, you see the initials on the trunks, JSP and ASP.) His daughter was Lily.